The information on this page comes from many different sources. If you have additional information or corrections you would like us to add, please send an email. If you are looking for a hemstitcher or you have one to sell, send us an email. We may be able to help you out! The beginnings of the present-day BERNINA International AG can be traced to Karl Friedrich Gegauf, who discovered his passion for technology as a child, and breaking with family tradition, decided to pursue an apprenticeship as a mechanic instead of studying medicine. After completing his apprenticeship he worked in the Baum embroidery machine factory in Rorschach, where his talent was recognized and encouraged. In 1890, Karl Friedrich Gegauf set up his own business in Steckborn, Switzerland, opening an embroidery and mechanical workshop for the manufacture of his own invention, a monogram embroidery machine. 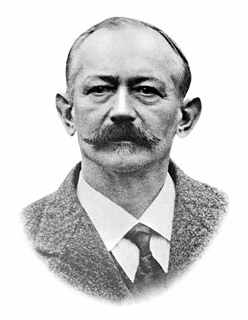 Together with his brother Georg, a salesman, Karl Friedrich ran the "Gebrüer Gegauf" (Bros. Gegauf) company. Through his involvement in the textile industry, he noticed how laborious it was to produce hemstitching, which until then could only be done manually. 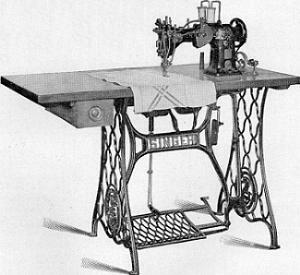 Consequently, in 1893 Karl Friedrich Gegauf invented the world's first hemstitch sewing machine, capable of sewing 100 stitches per minute. In 1895 the Bros. Gegauf workshop was completely destroyed by fire, except for the prototype of the hemstitch sewing machine, which was the only thing that could be rescued. Undeterred, Karl Friedrich erected a new workshop in an old barn, where the focus was no longer on embroidery, but on the construction of the hemstitch sewing machine, which the company now also exported abroad. 70 people were employed in the serial production of the hemstitch sewing machine. The name Gegauf became so famous that from then on, the mechanical production of hemstitching, whether as embellishment for handkerchiefs, tablecloths or bedspreads, was commonly referred to as "gegaufing". 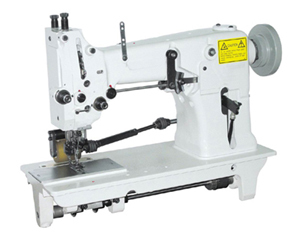 This is a single-needle / single-bobbin hemstitching machine. These machines are very rare. The stitch looks remarkably good for a single needle machine. However, when you look closely, it is obvious that a single needle machine was used. 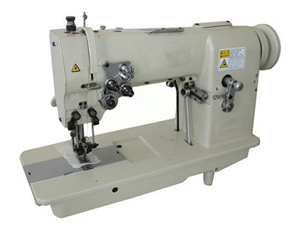 This is a double-needle / double-bobbin hemstitching machine. It is a commercial machine, made in the early 1900's. The machine is still useful today, although improvements were made in later years. 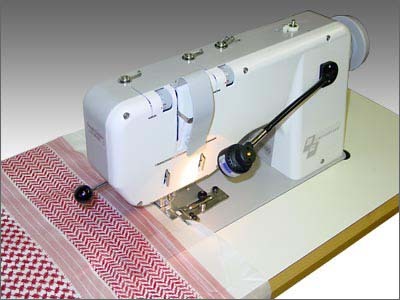 This is the most common hemstitching machine. With a little effort these machines can still be found. However these machines are more suitable for home use rather than commercial applications. The illustration to the left shows the machine on a table and stand. It is equipped with a 1/7 horsepower direct-current Diehl motor, enabling the machine to be driven at varying speeds up to 1300 stitches per minute. In 1914 a machine equipped as described, sold for $157.50 in New York. If furnished on a foot treadle stand its cost was $132.50. 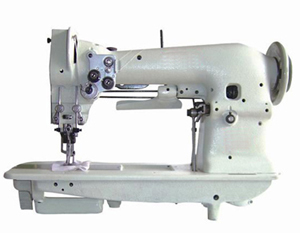 This is a single-needle / single-bobbin hemstitching machine. These machines are not very common but there are a few around. They usually cost between $1,500 and $2,500. The stitch looks remarkably good for a single needle machine. However, when you look closely, it is obvious that a single needle machine was used. This is a double-needle / double-bobbin machine built in the 1930's. 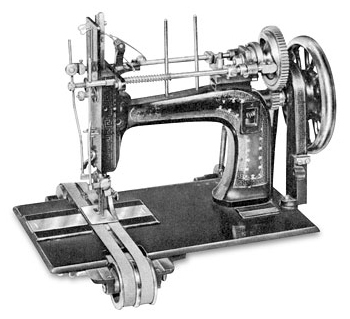 This machine represents Singer's years of experience building hemstitching machines. 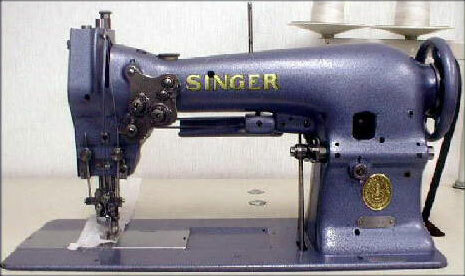 This appears to be the rarest of the Singer line of double-needle hemstitchers. However, with some diligence they can be found as well. Many are still in use commercially. This is a double-needle / double-bobbin hemstitching machine. 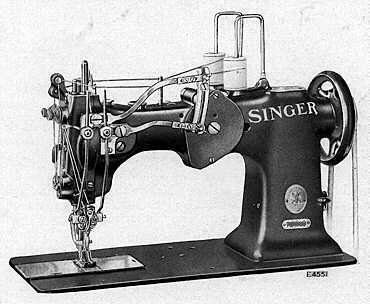 This machine appears to be a replication, mechanically, of the 1930's Singer 119w-2 hemstitcher. These machines are still made today by Tajima Group in Japan and are available for $10,000. 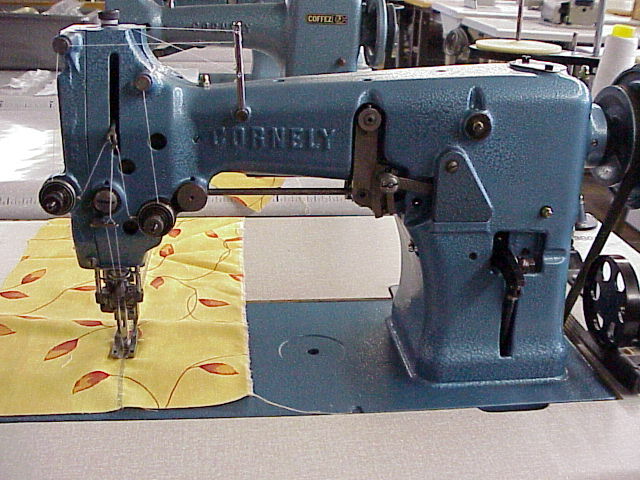 De Koninck manufactures the original Cornely 10 hemstitching machines. They bought Cornely France in the mid 1990's. All the parts were moved to their factory in Brussels Belgium. After the merger with Cornely, they completely remodeled the original models and changed the color of the machines to silver. De Koninck also developed new models such as the Cornely 18 for improved double layer hemstitching, and the Cornely 12 for one needle hemstitching of very fine holes. "The Cornely's have been around for a long time. In my opinion these are not very good machines. The major flaw is the inability to adjust the positioning of the piercers. This is important if you have different types of materials you are using. There is a manufacturer local to us that purchased one from France for $12,000 including shipping and they were not happy." This is a double-needle / double-bobbin hemstitching machine. It is manufactured by BG Switzerland. I have been unable to locate any in the United States. There seem to be some available in Europe for $11,000. I would like to try one, but at this price I doubt I ever will. This is the newest hemstitcher I know of. It has a radical new design rather than just another copy of the Singer 119w2 from the late 1940's. Some of the new features are: dry running (no oiling), band transport, two vertical hooks, bobbin change without removing the material, and built-in motor. The only down side I see is possibly the inability to adjust the positioning of the piercers. This is important if you have different types of materials you are using. The three most popular hemstitchers are reproduced in China and imported and sold in the United States. 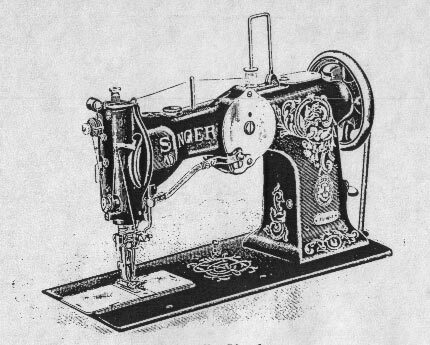 This attachment fits several of the early Singer household sewing machines. I would be interested in hearing from someone who has used one. I do not know how well they work. I would assume since most hemstitching is done with a double needle double bobbin machine that the quality of the work done by this attachment on a single-needle machine would leave something to be desired. "I have used this attachment. It is a lot of work to set up and the fabric must be very stiff. It takes two rows to make the hemstitch. It is extremely difficult to line the second row up. If everything works, the stitch looks pretty good but it takes a lot of patience." 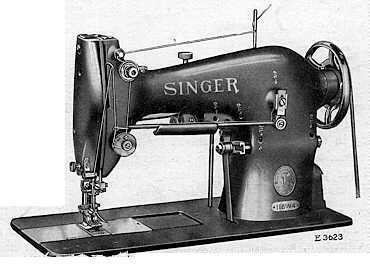 "I have the attachment from Singer and you are right about the quality of the stitch. It is difficult to get the hole punched in the exact same spot and the hole is not round and pretty." There are several of these attachments available for sale. They can usually be purchased for $20 to $30.